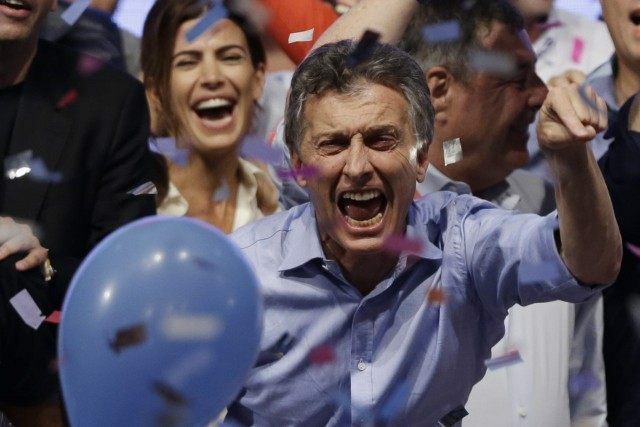 BUENOS AIRES, Argentina (AP) — President-elect Mauricio Macri’s promises to revitalize Argentina’s sagging economy with free-market reforms and improve strained relations with the United States resonated with voters, carrying him to a historic win that ended 12 years of often-conflictive rule by President Cristina Fernandez and her late husband. But when the business-friendly opposition candidate takes office Dec. 10, he will inherit a country with around 30 percent inflation, near-zero economic growth and entrenched government social spending that private economists warn is not sustainable. He also lacks majorities in either chamber of Congress to pass his deep reforms. With 98 percent of the vote counted from Sunday’s election, Macri had 51.5 percent support compared to 48.5 percent for ruling party candidate Daniel Scioli, Fernandez’s hand-chosen successor. Scioli conceded defeat and Macri claimed victory. The era he hopes to end is that of Fernandez and her late husband and predecessor Nestor Kirchner who rewrote Argentina’s social contract and dominated the nation’s political scene with a mix of patronage, charisma and withering attacks on opponents. Fernandez battled international creditors, had strained relations with Washington and allied her country with late Venezuelan President Hugo Chavez and his successor Nicolas Maduro. During the election campaign, Macri vowed he would listen more and talk less than Fernandez. Addressing thousands of supporters late Sunday, Macri said his presidency would not be about “revenge” or “settling scores,” but rather helping the country progress. But fulfilling his campaign promises may prove difficult. Macri, 56, has pledged to lift unpopular controls on the purchase of U.S. dollars and thus eliminate a booming black market for currency exchange. Doing that would likely lead to a sharp devaluation of the Argentine peso. With foreign reserves around $26 billion, low for such a large economy, the government would desperately need an immediate infusion of dollars. That could come from many different places, but ultimately would require structural changes to a largely protectionist economy, solving a debt spat and developing warmer relations with the United States and other nations. And Macri’s background will feed Argentina’s political polarization after more than a decade of left-leaning government. He hails from one of the country’s richest families and rose to prominence as president of the popular Boca Juniors soccer club. On the campaign trail, he sometimes talked about being kidnapped in the early 1990s, an experience he said helped him understand the needs of others and he credits with pushing him into politics. Later, as major of Buenos Aires, he was known for a technocratic manner that stressed efficiency over style. He campaigned for president on promises to jumpstart the economy by lifting many tariffs, lowering taxes and attracting foreign investment. He promised to solve a long-standing New York court fight with creditors in the U.S. who Fernandez called “vultures” and has refused to negotiate with, which kept Argentina on the margins of international credit markets. Scioli, the former governor of Buenos Aires province, had been expected to win by 10 or more points in last month’s six-candidate, first round of voting. His failure to do so set up Sunday’s runoff vote with Macri. Scioli tried to regain momentum by frequently attacking Macri. He said a Macri win would subject this nation of 41 million people to the market-driven policies of the 1990s, a period of deregulation that many Argentines believe set the stage for the financial meltdown of 2001-2002. “This is a painful day for Argentines,” said Rocio Robador, a government supporter who was crying in the iconic Plaza de Mayo. Robador, 36, said she was able to get pregnant and have a child thanks to a government that helps poor women get fertility treatments. Macri’s win signals a clear end to the era of Fernandez and her late husband. The power couple who gained popularity by spending heavily on programs for the poor, raising tariffs to protect local economies and passing several progressive laws, including the legalization of gay marriage in 2010. In recent weeks, Macri increasingly talked about international relations, signaling some of his foreign policy priorities. He said he would push to expel Venezuela from the South American trade bloc known as Mercosur because of the jailing of opposition leaders under Maduro. That would be a huge change for a continent where many countries, including neighbors Chile, Brazil and Bolivia, have left-leaning democratic governments that have maintained close ties with Venezuela. Associated Press writer Debora Rey in Buenos Aires contributed to this report. Peter Prengaman on Twitter: http://twitter.com/peterprengaman His stories can be found at: http://bigstory.ap.org/search/site/Peter%20Prengaman .